Trip to China to see the Olympics with my brother and his family. Fly on a BA Boeing 777 direct from Heathrow to Shanghai, about 11 hours. Arrive at Pu Dong airport at 8am. Robert and Peter have come to pick me up with Shagu, the driver. Head to Emerald Villas. 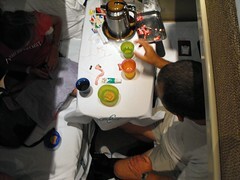 A few cups of tea and then we head to the pool, very warm and humid. Get the compound bus at about 1pm into the city centre. Walk through town to the Shanghai Community Fellowship. Starts to rain heavily. Must have a foreign passport to get in. I struggle to stay awake during the service because of the jet lag. Go for a meal afterwards, strange that the rice comes after the main dishes. Stay up till 11pm. Wake at 3:40 but misread for 8:20, puzzled why it is still dark. Lie in bed and sleep a little more. Breakfast and away by 10am. We all go to Decathlon to get Peter some more sandals. Call back to the house to get the phone number of the youth hostel, then to the youth hostel to get the train tickets and then on to the Bund. Gaze across the river towards the Pearl tower, etc. Stroll along the Bund and stop for ice cream. The four children get lots of attention. 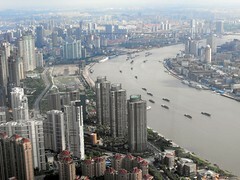 Get a boat across the Huangpu river for 2Y. Walk to the Jin Mao tower. Fantastic views from the top. Apparently it is possible to see the Yangse river but I can't. Sleep fairly well, get out of bed at 9am, the girls watch me put in my contact lenses. Mr Gu arrives and takes us to Tongli, takes about an hour. 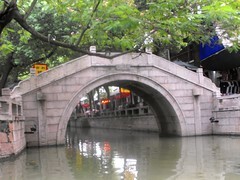 Tongli is a 1000 year old Chinese water town. Get a ticket which covers all the gardens, etc. Lots of old houses, carved tree roots etc. I take a video of them all playing the drums. I buy a large picture of a Tiger, after Lydia haggles, for about 100Y. We have a couple of peddle rickshaws to get around the town. Eat in a very Chinese restaurant, beef in parcels, chicken with peanuts, I have a beer. 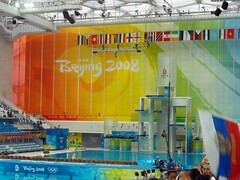 Watch the Chinese win the synchronised swimming. Have a quick boat trip along the canals. Torrential rain during our meal and also as soon as we set off home. Mr Gu drops as at the Cold Stone creamery, have mint ice cream. We have a couple of Pedicabs back, they get rather lost. Show Robert the picture of the Tiger when we get back. I notice the red spots of paint and we try and wash them off. A bit of a lie in till 8:30am, get up, breakfast. I head to the pool with the kids, Heather stays in the house to pack. I enjoy the swimming. Back from the pool for noon. Get a taxi with the kids to the Carrefour at Xujing. Buy a few things, then we all go for a subway, I am surprised how expensive it is. Lydia changes John's nappy in the middle of the shopping centre. Taxi back to Emerald villas. Robert returns from work at 5pm, then Mr Gu drives us to the station. We all work together to get onto the Z14 departure at 19:32. The train leaves bang on time, non-stop, 10 hours to Beijing. Not see much since it is dark almost as soon as we get on. In bed, lights out for 10pm. Me and Peter share a compartment. Awake at 6am. Breakfast turns up at 6:30, it is a strange Chinese interpretation of a 'Western breakfast'. It consists of two stone cold fried eggs and three slices of bread with jam between. Arrive on time at 7am. Taxi to Gerald and Serena's house, near Capital airport. Lydia and Esther are staying on the same complex with Caroline and Ritchie. Cups of tea and then we all go for a swim in the Swedish pool. As we order lunch torrential rains starts and continues for a couple of hours. 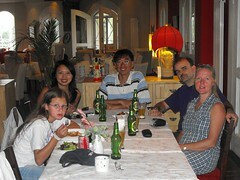 We order a Jin Bei to take us into Beijing to meet Sarah Evans. The arrangement was to meet at 3pm but it ends up being more like 5:30 since our taxi driver cannot find the hotel. Have a drink and watch the Chinese get gold at the women's archery. We find a McD's and eat there. Get a couple of taxis back. Have lots of cups of tea and a good wide ranging chat when we get back. Covers home schooling, via ferreta, lots of things. Bed for midnight, I sleep on the floor in the play room. Up for 8am, breakfast and away by 10am. Pick up Lydia and Esther from Caroline's house. 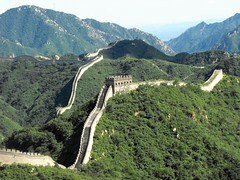 Get the same Jin Bei to Badaling. The plains of Beijing become mountains. Get the cable car up and walk to the 8th watch tower, very hot and incredibly steep. Fantastic blue skies. We meet the parents of Ross Davenport, they have noticed my Derby triathlon t-shirt. Can see the towers of Beijing 70 kms away. Walk down to the vehicle. Drive to JinChein, go to BigPizza, buffet goes down well. Lots of good singing from the gang in the back as we drive home. Back for 10:30, Cups of tea when we get back. Early breakfast. Get two taxis into town. Me, Lydia and Esther go in the first one. Drive past the iconic picture of Mao. Meet at the subway station at the south side of Tiananmen square. Exchange a few texts with Robert's party before we meet up. Walk past the hall of the deputies. Go for a KFC near the square, very busy. Get the tube to the Olympic village, we have a change 4 times, very clean and efficient. We have a problem getting the flasks of milk through security, after some tears and some negotiations the situation is resolved. Walk though the complex, it has three tube stations within the area. 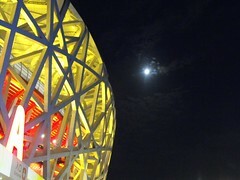 See the bird's nest and the flame from a long way away. I have a ticket in a slightly separate area to everyone else, but in the end there is enough room to sit with them. Watch lots of athletics, javelin, long jump, etc. The final event of the evening is the 100m final. Watch Usain Bolt easily win in 9.69 seconds. Great view of everywhere lit up when we come out of the stadium. Walk south out of the stadium, a long wait for a taxi. Get back for 1am. Lie in till 9am, watch a bit of the women's marathon, see Paula pull up injured. Annette is up watching in the UK. 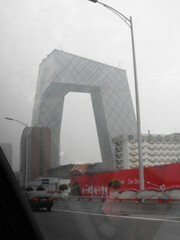 We all head over to the BICF in Central Beijing. The church service is in a theatre. An evening with the stars, Carl Lewis is the main speaker. Also Andreas from the Harlem globe Trotters, all good speakers. We move on to the New Veranda for a mea, I have the Nasi Goreng, very good, they comment on my liking for chilli, prawns, etc. Come back and watch a bit of table tennis and volley ball. Wake up when the boys invade my bedroom at 8am. I go with Gerald and his driver into town. He is off to work, I pick up some swimming tickets from the Rose town caf� near the Capital Mansion hotel. Back for 10:30am. 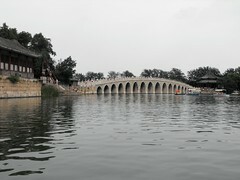 We take 2 taxis and head to the Summer Palace. Joshua comes with us. Walk around the south side of the lake first and over the 17 arch bridge. Take the ferry across the lake and walk along the long corridor. Get an electric self drive boat. I have some experience with water craft so I am appointed captain. I drive to start with and then everyone has a go. We land over on the far side and send a party ashore to get ice cream. We then head for the 17 arch bridge and everyone has a go at negotiating the arches. Walk up Longevity hill, good views from the top. See a picture of a Tiger just the same as the one which I brought in Tongli. It has red splashes on, just the same as mine does. Ask a few people and they say, it is a splash of colour, or blood. Get a peddle rickshaw to McD's. Taxi back home for a few cups of tea. We hire a Buick with a driver for the day. He takes us to watch the synchronised swimming in the water cube. We were expecting it to only last for 45 minutes, due to some miscalculation. We have to walk out part way through and walk back to the taxi. Get on the train at 19:32 as before. We all have large pot noodle for tea. Sleep well. Arrive back on time in Shanghai at 7am. Back to Emerald villas. I go swimming with the youngest three whilst the others sleep. Mr Gu picks us up and takes us into town. We book tickets for the Circus and then go to Peking duck to eat. We leave the tickets with Mr Gu and unfortunately he gets the wrong idea. 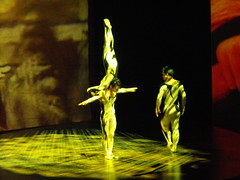 Watch the circus, very impressive. It culminates with 9 motorbikes going round the inside of a steel globe. Mr Gu takes Heather, Esther and me to Pu Dong airport. 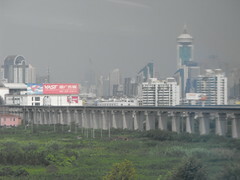 We have a quick spin on the Maglev train into Shanghai and back again. It goes at 431 kph, 260 mph, very fast. Buy a suspended magnetic globe. Catch the plane at 11am. 12 hours pass quickly, sleep a little. Leave Heathrow at 5pm.